Raman Sundrum, one of the world’s most prominent particle theorists, works in the fascinating world of parallel universes, warped space-time dimensions, the structure of the Higgs boson and other mysteries in the realm of physics. Currently a Distinguished University Professor at the University of Maryland and the director of Maryland Center for Fundamental Physics, Raman is particularly known for his famous contribution to physics: a class of models called the Randall-Sundrum models, which was first published in 1999 with collaborator Lisa Randall, now professor of Physics at Harvard University. Randall–Sundrum models (also called 5-dimensional warped models of particle physics) imagine that the real world is a higher-dimensional universe described by highly curved space-time geometry (where Pythagoras’ Theorem fails! ), but where the extra dimension(s) and curvature are hidden from macroscopic observers. These models are important for various reasons: First, it provides a possible answer to a question that has tormented scientists for decades, namely why gravity is so weak compared with the other forces of nature. It also helps to explain the pattern of interactions we measure among elementary particles. Randall-Sundrum models have also helped scientists in re-thinking superstring theory in physics — the vaunted “theory of everything” – and how it might be realized in Nature. 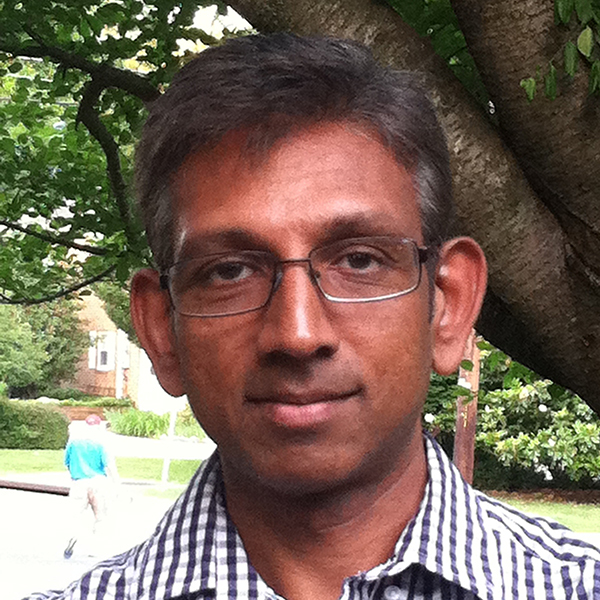 Today at the University of Maryland, Raman’s work centers on additional challenges in theoretical particle physics, focusing particularly on theoretical mechanisms and observable implications of extra space-time dimensions, supersymmetry, and strongly coupled dynamics within laboratory experiments as well as cosmological observations. Before coming to the university in 2010, he was one of two Alumni Centennial Professors in the Department of Physics and Astronomy at Johns Hopkins University. Earlier in his career, he was considering leaving the field of physics to pursue a career in finance, when the now famous author and collaborator Lisa Randall called to propose working together to extend Raman’s earlier work on membranes, or “branes” as they are known. (Branes are flexible subspaces within a higher-dimensional space). The results of that collaboration were papers known as RS-1 and RS-2, two of the most cited papers in fundamental physics. Raman Sundrum received his Ph.D. from Yale University in Elementary Particle Physics Theory, and his Bachelor’s of Science degree from the University of Sydney, Australia (graduating with First Class Honors in Mathematics). He was elected a Fellow of the American Association for the Advancement of Science in 2011 and a Fellow of the American Physical Society in 2003, and received the Department of Energy Outstanding Junior Achievement Award for 2001-2002.